BEIJING, Jan. 15, 2019 /PRNewswire/ -- The National Education Examinations Authority (NEEA), Ministry of Education, China and the British Council (BC) jointly released the results of their collaborative research on linking IELTS and Aptis to China's Standards of English Language Ability (CSE). The successful completion of the research marks the official mapping of the CSE to the international examination systems, while demonstrating that Sino-UK educational collaboration has moved to a new stage. Dr. Yu Han, Vice President of NEEA, commented, "The completion of the research on linking IELTS and Aptis to the CSE displays the CSE's value in practice, and demonstrates the best practice of aligning language tests to the CSE. It will shed light on language learning patterns of English learners in different areas. It also contributes to the 'opening up' of China's education, bringing 'China's standards' to the world and sharing Chinese wisdom in the field of language education." Prof. Barry O'Sullivan, the academic team leader from the UK's side and the Head of Assessment Research and Development at the British Council stated, "Both IELTS and Aptis are communication-based tests as they focus on all four language skills (listening, speaking, reading and writing) and assess test-takers' actual ability to use the English language. This notion lays a solid foundation for linking the two tests to the CSE, which is a use-oriented English language proficiency scale. The linking results will be of particular value to policy makers at educational institutions, by helping them to develop appropriate curricular objectives to meet globalisation goals. They will also encourage the improvement of teaching methods, learning materials and teaching practices in classroom. The results will also allow test-takers to have a deeper understanding of their English proficiency by referring to the descriptions of language ability in the CSE that are mapped to their IELTS or Aptis test score. This will enable them to devise an appropriate learning plan. In addition, test users such as schools and employers will be able to select the appropriate test score boundary, by referring to the linking results and CSE level descriptors which meet their requirements of students' English proficiency." To promote the comprehensive reform and development of foreign language education in China and to cultivate talents with global vision, language proficiency and a comprehensive knowledge of the international community, the State Council of China decreed in The Implementation Opinions of the State Council on Deepening the Reform of the Examination and Enrollment System that a national assessment framework of foreign languages should be established. The CSE was developed as the fundamental element of National Foreign Language Assessment Framework. 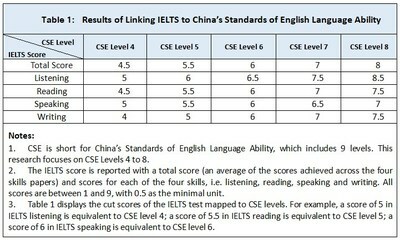 The CSE, the first full-range English proficiency scale designed for Chinese English learners and users, was released by the Ministry of Education and National Language Commission, People's Republic of China in February, 2018. Its English version was released on December 1st, 2018. Based on empirical research data on the ability and needs of Chinese English learners at multiple learning stages, the CSE categorises the ability of Chinese English learners into 9 proficiency levels across 3 broad stages depicting the development of language ability. The CSE adopts a use-oriented theoretical framework and has a multi-tiered descriptive scheme, defining language proficiency levels comprehensively through specific, accurate and easy-to-understand descriptors for each level. It is expected that the CSE will serve as a fundamental strategy in promoting English learning, teaching and multi-dimensional assessment in China. On 6 December, 2016, Mr. Chen Baosheng, China's Minister of Education, and Ms. Justine Greening, the UK Secretary of State for Education, signed Action Plan under the UK-China Partners in Education Framework at the 4th Meeting of the China-UK High-Level People-to-People Dialogue in Shanghai, China. 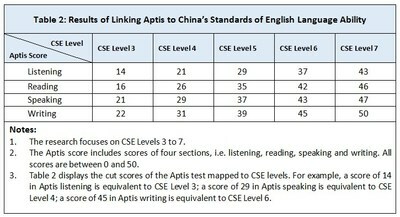 The document stated that in order to promote meaningful communication and an understanding of the alignment of English proficiency standards in China and the UK, the two countries would conduct a collaborative research on linking specific English language tests currently in use to China's Standards of English Language Ability. IELTS and Aptis were chosen as the first two exams for the linking research. The National Education Examinations Authority (NEEA), Ministry of Education, China and the British Council were appointed respectively to implement this joint programme. Launched at the beginning of 2017, the collaborative research on linking IELTS and Aptis to the CSE took two years to complete. The team members include representatives and researchers from NEEA, Chinese academic institutions, the British Council, and Cambridge Assessment English. The research team referred to previous studies on linking international language tests to language standards and employed a scientific approach which integrated expert judgements and empirical data, collecting evidences from multiple sources. This ensured that the linking claim would be both valid and reliable. The research also saw the active participation of experts, scholars, teachers and students from various regions in China. In addition, NEEA and BC jointly held International Conferences on Language Testing and Assessment in several provinces, where hundreds of experts from home and abroad exchanged their ideas and research findings on the application of the CSE and the implications of the research on English learning, teaching and assessment in China. Since its launch in 1989, IELTS has become the world's leading English language test for higher education and global migration; delivered at over 1200 locations in over 140 countries and accepted by over 10,000 organisations globally. Each over 3 million IELTS tests are taken by people seeking to demonstrate English language proficiency for education, migration or employment. The British Council, IDP: IELTS Australia and Cambridge Assessment English jointly own IELTS. Aptis is an innovative global English assessment tool developed by the British Council. Featuring a unique flexibility and convenience, Aptis supports schools and institutions with efficient solutions for comprehensive four-skills testing. As Aptis quickly and accurately assesses English proficiency level, it offers reliable evidence of the communicative ability of teachers and students and support schools to improve the quality of English teaching and assessment and boost internationalization.